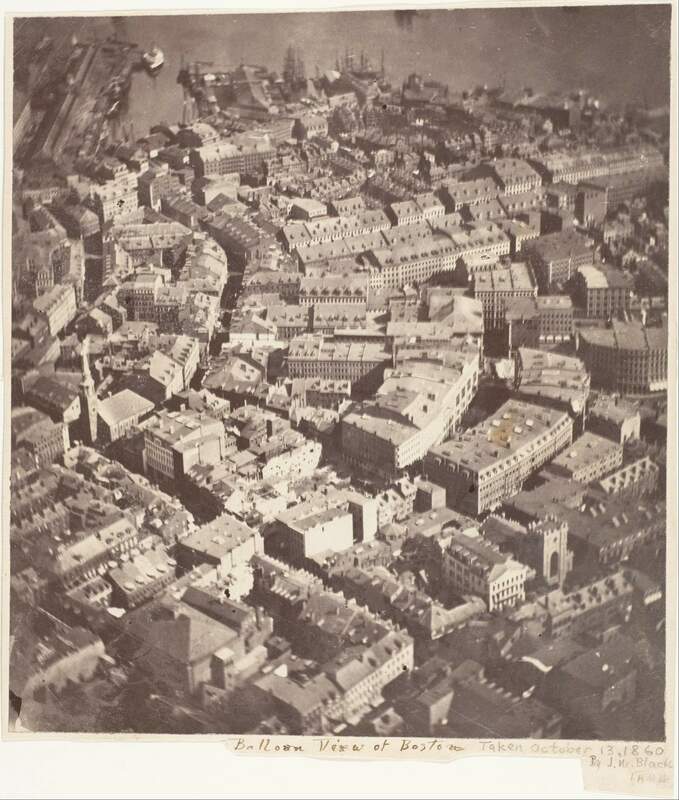 On October 13, 1860, the early American photographer James Wallace Black (February 10, 1825 – January 5, 1896) climbed into a hot air balloon (named Queen of the Air) with his camera, and photographed Boston from a hot-air balloon at 1,200 feet (around 365 meters). He was not the first person to do it: two years ago, French photographer (and also caricaturist, journalist, novelist, and “balloonist”) Gaspard-Félix Tournachon (6 April 1820 – 20 March 1910), known by the pseudonym Nadar, who photographed Victor Hugo on his death-bed in 1885, took photographs of Paris from a hot air balloon too. But the Frenchman’s photos were lost many years ago. On that day, Black took 8 plates of glass negative; 10 1/16 x 7 15/16 in, but only one good print resulted, which the photographer entitled “Boston, as the Eagle and the Wild Goose See It”. Today, it remains the oldest surviving aerial photo. “Boston, as the Eagle and the Wild Goose See It,” the first recorded aerial photograph. Depicts area resembling Old South Meeting House; Milk Street; India Wharf, Central Wharf; and vicinity. It was taken by the early American photographer James Wallace Black (February 10, 1825 – January 5, 1896) on October 13, 1860. Medium: Albumen silver print from glass negative. Dimensions: Image: 18.5 x 16.7 cm (7 5/16 x 6 9/16 in. ), irregularly trimmed Mount: 20.3 x 17 cm (8 x 6 11/16 in. ), irregularly trimmed. Credit Line: Gilman Collection, Purchase, Ann Tenenbaum and Thomas H. Lee Gift, 2005. Image source: Metropolitan Museum of Art. Shortly after the above photo was taken, aerial photography would be put to use by the Union Army in the American Civil War. James Wallace Black born on February 10, 1825 in Francestown, New Hampshire. While a teenager, he tried his luck as a painter in Boston. Then he turned to photography, beginning as a daguerreotype plate polisher. Invented by the French artist and photographer Louis-Jacques-Mandé Daguerre (18 November 1787 – 10 July 1851), this process, also known as daguerreotypy, was the first publicly available photographic process. For nearly twenty years it was also the one most commonly used technique. By 1852, he was apprenticed to the famous American inventor and early photographer John Adams Whipple (September 10, 1822 – April 10, 1891). Whipple was the first in the United States to manufacture the chemicals used for daguerreotypes. Whipple was also a pioneer of astronomical and night photography. He was a prize-winner for his extraordinary early photographs of the moon; and he was the first to produce images of stars other than the sun (the star Vega and the Mizar-Alcor stellar sextuple system, which was thought to be a double star until 2009). So, between 1857 and 1860, Black managed the business single-handedly, while Whipple completed a three-year scientific exploration of celestial bodies at the Harvard College Observatory. Black was not so-interested in astronomy, and in general, abstract science. 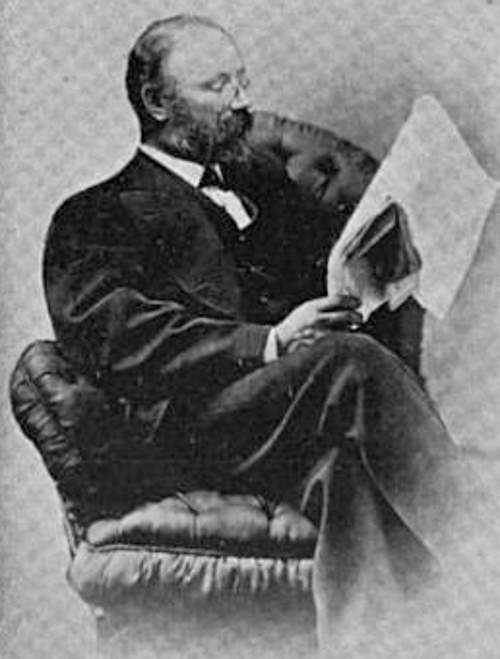 He left Whipple in 1859 to focus the camera on his own planet. And in 1860, he took the famous image above, the first clear aerial image of a city anywhere, and also the oldest surviving aerial photo. James Wallace Black in 1896. Image: wikipedia. He later became the authority on the use of the magic lantern, a candlelight-powered projector that was a predecessor of today’s slide projectors. By the late 1870s Black’s business largely consisted of lantern slide production, including his famous images of the Great Boston Fire of 1872, published a photographic album titled Ruins of the Great Fire in Boston, November 1872. It was Boston’s largest fire, and still ranks as one of the most costly fire-related property losses in American history. In twelve hours, the flames had consumed about 65 acres (26 ha) of Boston’s downtown, 776 buildings and much of the financial district, and caused $73.5 million in damage. Fortunately, only thirteen people died during the devastating fire. James Wallace Black died on January 5, 1896 and was buried in Mount Auburn Cemetery in Cambridge, Massachusetts.